Nearly final draft of Gotham City map by Eliot R. Brown. The Atlas of the DC Universe, created in 1990 for a Role-playing Game, included a rare map of the DC American showing Gotham and Metropolis on the East Coast. Looking for a Gotham City map? Here’s a collection of Gotham maps gathered from comic books, films, and video games. 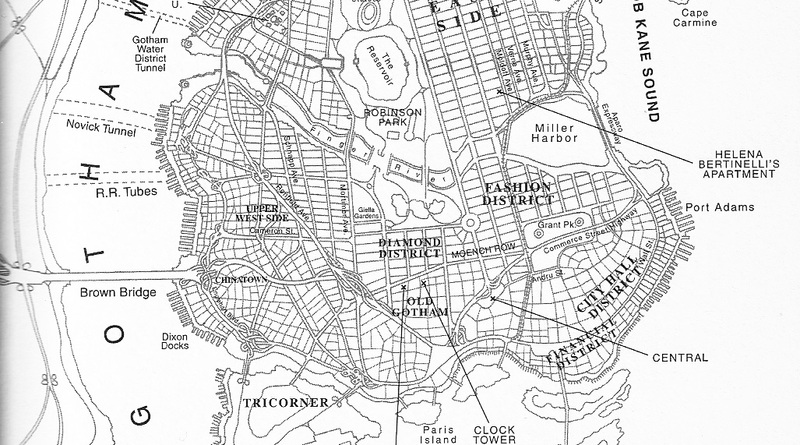 While Gotham has appeared in many forms since its inception, the Gotham City map was formalized in 1999 during the No Man’s Land storyline, when comic book cartographer Eliot R. Brown defined Gotham City as a series of islands connected to each other and to the mainline by a series of bridges and tunnels. Brown’s map of Gotham is still part of official comics canon, as seen in Scott Snyder’s run on Batman. It has even been adapted and integrated into Christopher Nolan’s Batman films, as evidenced by several of the films’ overhead shots, brief scenes depicting maps, and viral marketing campaigns.